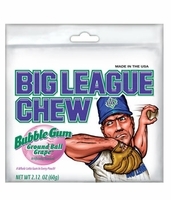 Big League Chew Grape Gum - 1 Pack. A great grape flavored bubble gum. This nostalgic gum is a favorite of baseball players. It comes in a cool foil pouch, you can take out what you want and save the rest for later without it getting hard.